NYC, 02/20/2019, 6:00PM. Escaping the Energy Poverty Trap: When and How Governments Power the Lives of the Poor. Johannes Urpelainen explores why energy poverty is persistent in some countries and not in others. 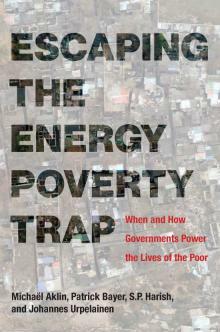 Drawing on case studies from India, East Asia, Africa, and Latin America, Urpelainen and his co-authors assert that energy poverty is a policy problem, and engaging with it as such offers new opportunities not only for ensuring equal energy access, but also for political, economic, and environmental development. Following Dr. Urpelainen’s presentation, he will join Michelle Keane, World Bank Program Manager for the Sint Maarten Recovery, Reconstruction and Resilience Trust Fund, on a panel moderated by Philippe Benoit, Adjunct Senior Research Scholar at the Center on Global Energy Policy.